Families and children feel right at home in this clean, comfortable, contemporary house with large living/dining area, fireplace, custom kitchen, all appliances, free high-speed internet, screened porch and deck, BBQ, enclosed outdoor shower, and free access to association pool (June 15 - Sept 15) and tennis (year round). Ferry tickets available from owner at cost. Located in Stoney Hill Farms in West Tisbury, Martha's VIneyard, Massachusetts. Easy bike to Lambert’s Cove Beach (3 mi. ), village center (4 mi. ), State Forest (1 mi. ), Vineyard Haven (4 mi.). Quiet rural neighborhood with large lots. Backyard opens onto conservation land. Paved bike trails nearby. Walk-on pass included for delightful Lambert’s Cove Beach on Vineyard Sound. Easy access to Long Point and other beautiful ocean beaches. We are the original owners of this delightful home on our beloved Martha's Vineyard, where we have been coming since childhood. Sharing it with others as a vacation rental made it possible for us buy it, and we've had completely positive experiences since we began in 1994. Linens and towels are an optional service for $150. Or you can bring your own. Good for outdoor play, but not in golf-course condition. Porches/entries are 3-1/2 steps up, which is why it is categorized "wheelchair inaccessible.' However, if you are able to get up the three steps, the first floor itself is wheelchair friendly, and there is a low-threshold shower with shower seat and hand-held shower head in the master bathroom, plus detachable handrails for the toilet. Stoney Hill Farms Association Pool included in rental. Pool is across the lane. Typically open June 15 to September 15, but we cannot guarantee the pool will be open or available any particular time. Guests with limited mobility are welcome. The master bedroom and bath, kitchen, dining, and living area, decks and screen porch are on the 1st floor. However, there are 3 steps from the ground to the house entrance. Great House, Location and owner! Thanks very much for your kind words, Rebecca. Glad you had a wonderful time. We really enjoyed having you as a guest and would love to have you back next year. It's a good point for people considering renting to keep in mind--the house does not have air conditioning. My 13 y.o. grandson announced "this house is awesome" after a quick trip to every room and a walk outside. Later, he and my 11 y.o granddaughter would, usually after several hours of kayaking or being at the beach or pool, still have energy for the ping-pong table for 1-1.5 hours. My first loves were the 2 story LR/DR, the wide board floors, comfy LR chairs, and the well supplied kitchen. Later, I was impressed with how organized everything was, to wit, I never had to ask the owners a question about where to find something or how to make it work. The temps were warm outside during our stay but the house's beautiful cross breezes kept us comfortable. Very peaceful environment. My husband reads and is not into TV so he was very happy that the wireless headsets enabled us to sit in the same room at night while I watched netflix shows. I was impressed that the kids, who did have tablets with them as the house has wifi, never asked to watch the large screen TV as they could choose to get games on their tablets or play foosball, darts, or ping-pong. I enjoyed doing my water aerobics routine at the pool. Everything was easy at this house. Having the ferry tix included made it feel like an all inclusive vacation. We enjoyed Lambert's Cove Beach, Audubon's Marine Discovery Tour and their kayak tour, visiting the Trustees' Farm Institute and their Chappy lighthouse tour and kayak tour. The house has everything you need, and Will was very helpful answering questions -- we had lots, since it was our first time on MV! The property is in a very quiet area next to conservation land which has walking and biking trails. Lamberts Cove Beach is a few miles away and is very beautiful. The water was warm enough in August for an enjoyable swim. It's just a short drive to Oak Bluffs or Vineyard Haven to shop or eat out. At night it was delightful to eat by candlelight on the screened-in porch, listening to the crickets and inhaling the sweet smell of the woods. Another great week in a great house. This was our second year staying at this fantastic summer/vacation home. We liked it so much last year that we didn't bother looking at any other properties. 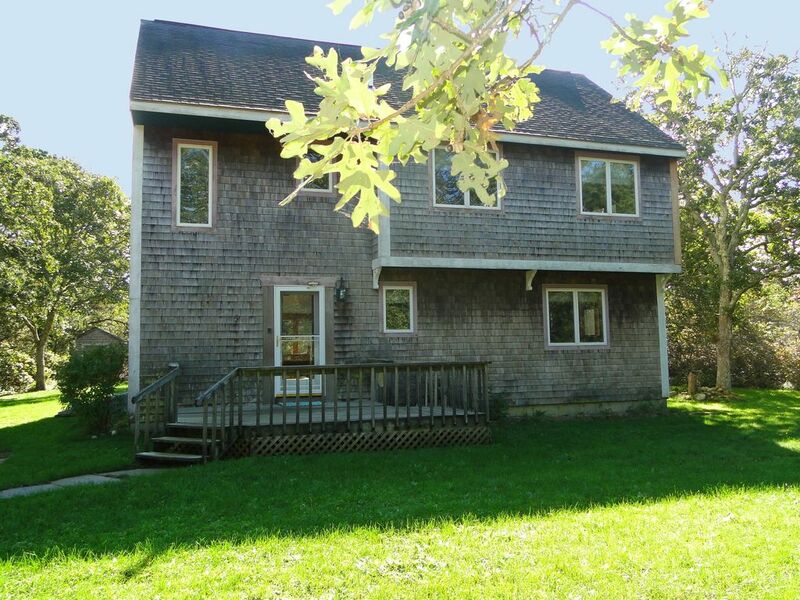 The house is centrally located on the island making it easy to get to beaches and other towns. It is a classic summer set up, but the feeling of ease and relaxation that permeates the house must be felt. The screened-in porch and deck/backyard make for a perfect place to relax at anytime of the day. The washer-dryer made traveling to the island so much easier, and there is every kitchen product you might need. Our kids loved the pool across the street as they spent a few afternoons in it during our stay. Lastly, the owners are fantastic, address and issues immediately, and are a large part of why we love the house so much. If you want a truly relaxing and enjoyable Vineyard experience, rent this house. The house was spotless, beautiful secluded location with tennis courts and pool but centrally placed to make any day trip easy. Suffice to say, a wonderful, stress free vacation thanks to the thoughtful planning of the house owners. Beaches, bike trails, swimming, fishing, hiking, surfing, sailing, boating, America's oldest carousel, shopping, whale watching, crabbing, shellfishing, parasailing, jet skiing, music, art galleries, farmers' market, agricultural fair, camping, historical museums, lighthouses, nature parks, golf, mini-golf, tennis, restaurants, horseback riding. All rentals are from Saturday to Saturday. Optional ferry reservations available from owner at cost during summer peak season. Optional linen service $150 can be added at your request, otherwise bring your own bath, hand, and beach towels, wash cloths, and linens (2 queen, 3 twin, one full sleep sofa). Blankets, comforters, dish towels, and bath mats are provided even without the linen service.